Physical characteristics: Also called the golden-breasted whistler, this bird is small, measuring 5.9 to 7.5 inches (15 to 19 centimeters) and weighing 0.8 to 0.96 ounces (21 to 28 grams). It has a black bill, head, and band below a white throat. The back and wings of the male are olive green, and the undersides are sulfur yellow. The female has a muted olive gray body with a pale yellow belly. Both sexes have reddish brown eyes. 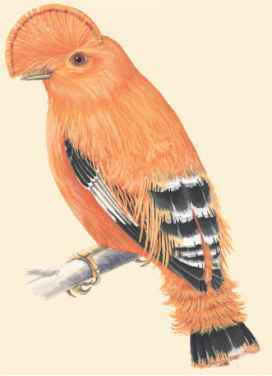 Young birds of both sexes are reddish, changing to the muted colors of the female. When they are fully mature, male birds will display bright plumage. 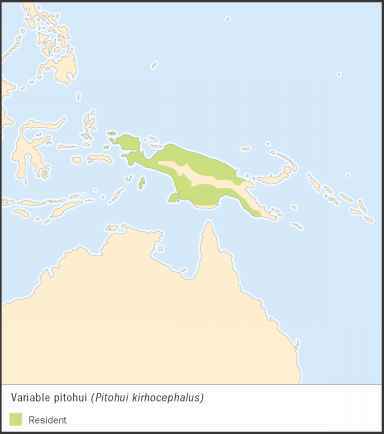 Geographic range: Over seventy subspecies of golden whistlers live in Indonesia, New Guinea, Tasmania, and the southern and eastern coasts of Australia, as well as small Pacific Islands such as Fiji and the Solomon Islands. swamps. Occasionally, these birds will occupy trees in orchards and parks. Golden whistlers nest below 6,900 feet (2,100 meters). Diet: This species eats mainly insects, spiders, and berries. Behavior and reproduction: Golden whistlers mate in the spring of the southern hemisphere, September to January, and only have one brood. Both the male and the female build a cup-shaped nest from bark and twigs, lashed together with spider webs and lined with fine grass. 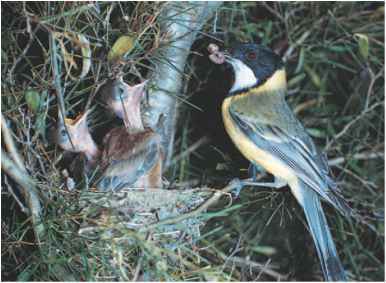 Placed in the fork of a branch or nestled deep in a shrub, the nest can be as high up as 20 feet (6 meters). The female lays one to three spotted eggs of varying colors. The eggs can be cream, buff, salmon, or pale olive green with spots or blotches of greenish brown, or reddish brown, gray, or lavender. Sometimes, these blotches collect around the larger end of the egg like a cap. Both parents incubate the eggs, usually fourteen to seventeen days. The young birds are fed by their parents for ten to thirteen days. This species forages among tree branches in the middle story of the forest canopy, only searching the lower level when necessary. Sometimes, golden whistlers will hawk, or dive, for insects they see, but usually they settle on a branch and glean insects and berries from their perches. Australian birds will migrate to the north or west during the winter or descend to lower elevations. Golden whistlers and people: The golden whistler is appreciated by bird watchers. Conservation status: Though this species was once quite common, it is now a protected bird in some areas of Australia and efforts are being made to ensure that these birds can increase their population numbers.